Women’s Basketball: West Virginia tops Rutgers, heads to Big East final. HARTFORD, CT- Minutes before the number 1 ranked team in the country won their game and advanced to the Big East finals leaving Rutgers and West Virginia to battle for who would face them, and a battle it was with numerous fouls being amassed by both teams, though Rutgers had a run on them in the first half especially. WVU pulled out to several leads only to have Rutgers fight back, though the last lead proved to be insurmountable in the time available. The game opened with a Rutgers shot clock violation which somewhat set the tone for a rough and tumble game. The two teams reached a 6-6 tie about five minutes in. 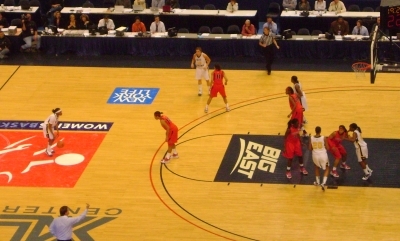 Miya McCurdy hit a medium length shot to take the lead for Rutgers, but the dangerous Sarah Miles hit a shot from just outside the paint to tie it up, a three pointer would follow for the mountaineers, and Vanessa House would steal the ball and go all the way back to score two more for WVU despite a bump from the defender. It was now 13-8 with 12 to play in the half. Soon afterward, Natalie Burton put in an offensive rebound from below the net to add to the gold and blue’s lead. Monique Oliver broke the scoring drought for RU putting the ball in the net around a defender. Neither side made a shot for a while, but after some fouls it was 19-10 with 7 to go. Yet another RU foul put Asya Bussie at the line and she made both shots, but a Scarlet Knight drained a 3 to cut the lead to 21-13. Nikki Speed of RU was fouled going on a fast break and she scored both to bring it to 21-15, she then soon after received a long pass following a Rutgers steal to bring the score to 21-17 with 4 to play. Time passed, and WVU could not add to the lead, instead Khadijah Rushdan laid in a basket for another RU pair, and Oliver scored two from under the basket to tie it up and lead to a Mountaineer time out. WVU picked up two more with little time left in the quarter, but RU responded with two of their own, and Speed picked off the inbounds pass and scored two more, tying the game up right before the buzzer at 25. When the second half resumed, baskets by Miles and Bussie put the Mountaineers up by 4 again, but Ray and later Oliver hitting two free throws tied the game back up at at 29. Rutgers actually took the lead after Rushdan scored 2, but WVU hit an open 3 and took the lead back. With 15 minutes left in the game it was still 32-31. Several fouls followed but eventually Korinne Campbell hooked the ball over a defender and drive through traffic after that to produce a 36-31 lead, and Miles added to it, with a miraculous jump in the air which swerved to avoid a defender and get the ball in. April Sykes scored two for the Scarlet Knights, Chelsey Lee scored two in the paint, and later Rushdan hit a jumper to pull within 3, but Miles responded by moved to the center of the zone and scoring. Her teammate Liz Repella added to the damage with a 3 pointer. Bussie struck soon afterward and the score was 47-37 with 9 to play. A dive for the ball a minute later sent a player from each team crashing into a press table in the corner, but not one was injured. Rutgers picked up 2, but Miles hit a three edging the score to 50-39. A made Rutgers free throw cut the lead, but WVU made a two pointer to negate the gain. Rushdan cut it to 10 again, but time was growing short. In a continually rough game, each side traded buckets, but WVU could afford to. Oliver made the lead just 6 when she scored in spite of defenders, but a foul gave Campbell two shots and she made them. WVU’s House hit 2 though, and with less than 2 to play it was 54-48. A made three throw gave WVU one more and no other scoring occurred until 33.5 seconds when a foul was called on Rutgers. The Scarlet Knights were unable to come back and the score ended up being 56-49 when the horn sounded. Yale and Springfield meet on SC’s Senior Day.